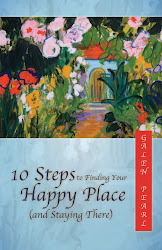 I guess all of us have our own happy places in our homes, though some prefer going out and find their inspiration there. I guess any place where we feel comfortable is what works well, and for me it's always been home. Harleena, Like you, I have many happy places in my home. It's interesting, isn't it, that you and I both like the places where we write! Thanks for commenting. I feel that every place that we spend more time - like our offices / homes we do have our own special corners/ places which make us feel happy. Me, The first time I walked into my home when I was house hunting, I saw all the family pictures of the woman who owned the house before me. I felt like I was walking into her family. The house immediately felt like home and I bought it right away. That was over twenty years ago and it still feels like home. Thanks for commenting. Funny that you mention this, as I am in the process of reopening what once was my office, and most happy place (seriously, my desk too) which are also plenty in our house! It will be my new studio! The room has it's own entry way outside to a smaller deck, and it has a built in bar(antique bar from our town's old pavilion) which will do just wonders for all my artwork! We've done a lot of that switching around too, and it seems each new beginning of a room tends to shed some of the past joys as well. Happy places are important! Karen, Your new studio sounds so inviting. I hope you will post some photos of it, if you haven't already. (I need to pop over and catch up with you!) Thanks for commenting. Happy places can also be a physical place. My bedroom where I spend most of the time writing, reading, watching TV, listening to music while my beagle sleeps in peace right next to me is my happiest place. I can be myself there, laugh, cry and yes there is a sense of peace and well being in this room. Lovely reading you as always, Galen. Rimly, I like my bedroom, too! Thanks for commenting. My front porch..does that count? I LOVE where I live...sometimes to the point that I think "I need to go somewhere" but I don't want to leave...what a problem to have..ha! Of course front porches count! I'm like you--there is no other place I want to be, except sometimes at my cabin. Thanks for commenting. I love our downstairs guest room which is the only room in the house decorated specifically to my taste. It has soothing colors and just a touch of Victorian. I call it the "quiet room" and it is where I go to be surrounded by my journals, books, family photographs and quiet music. When I close the door I feel completely alone and at peace. Suzanne, I like that, a quiet room. I guess this is my quiet room. Thanks for your comment. My favorite spot is our wraparound porch. Living for so long up North, I was only able to use the porch a few months out of the year. Now, I can enjoy it nearly year round! I love to hear the birds and smell all the flowers and watch the dogs play in the yard, so I grab my laptop and head out. Sometimes I just grab my lap! I have books all over our home about sleeping porches, front porches, etc. Nothing beats watching a bird build it's nest or a flower open for me. It's a very happy place. Enjoyed this post. Kathy, Oh, I love wraparound porches. There are several lovely ones in my neighborhood. I have a tiny front porch that sits next to the dining room. It is very pleasant, but small. Then I have a patio in the back yard which is also nice. The old homeplace where my mom grew up has a sleeping porch. My cousins and I slept there many a night. Thanks for commenting. I love my whole house. In trying to answer this i feel like I cannot eliminate one section. They all fill me with this kind of pleasure! That's for making me remember this appreciation! Jodi, I love my whole house, too! Each room has it's own joy. So I don't think we have to eliminate any part of our home. I just wanted to focus on one of many happy places! Thanks for commenting. Whenever I step into my bedroom, I feel so peaceful and at ease, but I have other "happy places", too - my computer corner and our back deck. Come to think of it, my entire home makes me happy. I feel so blessed to live where we do. Martha, I love my bedroom, too, and especially my bed. When I've been out of town, I love getting back to my bed. In the morning, I like to lie awake for a little while and look out the window before I get up. I feel blessed, too. Thanks for commenting. Depending on the time of year, my happy place is either the back porch when the weather is cooler, or my office with my guitar, computer, and ham radios. When Betty and my daughter are both home, the living room, with us watching a favorite movie while Bailey the dog curls up on a lap, would qualify. I know the room you are talking about and understand completely why that (or your little front porch) would be where you gravitate. Enjoy! Bob, That's true. My favorite place can change with the seasons. Like right now, my favorite place is in the recliner watching football--ha! Glad you can recognize the room I'm describing. Thanks for commenting. So sweet! I have a favorite spot in each room in our home, Galen, with a little footstool nearby. I love it when my son or husband sit nearby and tickle the soles of my feet. :D Absolutely blissful. We also work well - each of us in our sweet spot in the room where we spend time together. I love our easy relationship, cozy and happy. Vidya, I have a favorite spot in each room, too. I love your description of yours! Thanks for commenting. This was a lovely post. I knew immediately what my favorite spot is in our home. I liked that you chose your daughter's room. My favorite place is our small front room. The view from the window is sweet. My piano is in there and I love playing it. I also love to sit and read in that room. I have some very special pictures on the wall. One is of Christ visiting the sick and the other is a picture of the Temple my husband and I were married in. There is peace in that room. You room discription was warm and inviting. LeAnn, A room full of peace is bound to be a happy place. Thanks for sharing the description of yours. And thanks for commenting. I do indeed have my favourite corners in our flat. Such as the living room sofa and my bed. Yeah, you got those right, both are things I can nap on. lol Joking aside, though, indeed a very nice post and topic. I enjoyed this. Thank you. Dave, One of my favorite places at my cabin is the recliner where I often take a nap when I first arrive to transition from city busy-ness to cabin quiet. Thanks for your kind words. Nicole, If it's full of you, it must be marvelous. Thanks for commenting. There's a long sofa in our living room. When I lie down there, my cat Larisa finds me quickly, and she lies down as well. I read there, too, backlit by a "barnyard theme" lamp. And sometimes in the evening, my husband and I watch a Netflix show. It's like the sofa is waiting for me to relax. Linda, I used to love snuggling with my dog Sadie on the sofa here at home or in the recliner up at my cabin. Inviting furniture and an animal to share it with is definitely a happy place. Thanks for commenting. I'm looking forward to creating new happy spaces in my new home. I have a neat little balcony, I'll be sure to make it cozy. I remember one of the first books I read to get myself out the rat-race mode and to focusing on what's important was this book " Creating a Charmed Life" by Victoria Moran - it's a good book that makes you think and even do to help oneself live a more 'present' existence. B M, Thanks for the tip on the book--I'll check it out. And a new home to make happy. Congratulations! Thanks for commenting. I have got to say it's my kitchen. Since I was a child all the women in the family gathered in the kitchen to talk and bake at the same time. The youngest children had to stay in the kitchen with the women as the men were all hanging out in the workshop or barn. Thank you for bring this memory back to me. Hope you have a great day. Bonnie, Kitchens are great, aren't they? Whenever I have people over, we all end up in the kitchen! Thanks for your comment. Sounds like this room has the perfect feng shui! I love my bedroom the best. It's nice to have a cozy place. Sandra, I like my bedroom, too, especially my bed. A wonderful place to wake up every morning and greet the new day. I love my whole house,and I use cleaning each room or area as a gratitude meditation for what a lovely spot this is. When the world was too overwhelming and I was being asked to care for so many other people's children...I home schooled my own children because they were home for such a short time in their lives and they were the people I wanted to be most with and spend time with...this made me happy and when I look back at this part of my life, it overall radiates a joy. With my computer handy and so many lovely spots...I am amazed at how contented and happy I am when home. Patricia, I love my whole house, too. Each room has its own energy, and even different places with each room do, too. Like you, I am so content to be at home. I love walking up my front walk to the door and stepping inside. Evelyn, That's interesting that you have different places for meditation. I tend to use the same place in the house. Maybe I will try some new places! Dawn, I am always at peace in the woods. I love mountains and forests and creeks. Maybe I was a deer or a mountain goat in a previous life! Dawn, It's interesting that many commenters are appreciating the place where they are on the computer. I'm going to reflect on that a bit. I love my garden, too. What a nice post, Galen Pearl. By the way, my mother's name was Pearl. I love my current home too. Whenever I move into a new home I ALWAYS chant, play music, ring chimes or bell - addition to cleaning with essential oils - to move negative energy. And every seasonal change I de-clutter and clean thoroughly. Presently, my bedroom is my fave. Also the kitchen. I am happy your daughter's room brings you much joy. Cheers!! bobby, I love the name Pearl and always wanted to name one of my daughters Galen Pearl. I never did, so when I decided to use a pen name, that one was waiting for me. I guess it was always meant to be my name! Galen Pearl is a pretty name. Cheers!! I never realized I loved my house before having to leave it. I don't have my own place now and it doesn't feel nice at all. It's now that I really get how important it is to have a place to stay.